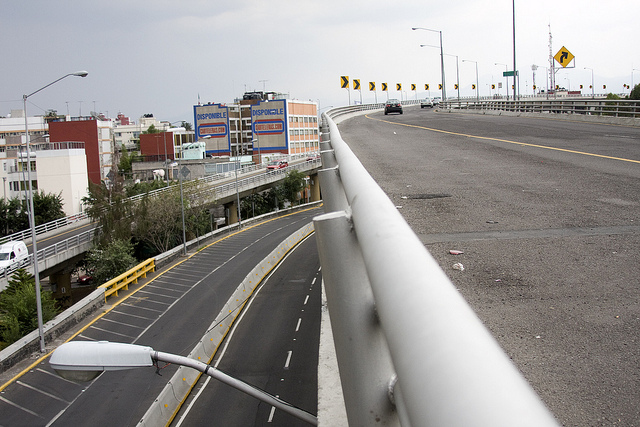 The lack of proper pedestrian infrastructure contributes to road safety problems in Mexico. Photo by EMBARQ. Early last month, The Economist published an article on the relationship between road safety in Mexico and lack of discipline in driver training and testing programs. The article makes the argument that without a universal testing scheme, Mexico will not be able to achieve road safety. Do you agree that a lax driver testing system is a symptom of the country’s overall disregard for road safety? The driver test is the initial phase to control who is driving on our roads, but it is just one control that does not necessarily have the highest effect on the index of crashes per inhabitant. Driver training and driver tests are necessary in the process of reducing road crashes, but in my opinion, they are not the key point. They are the initial phase of a long process where general control and enforcement, regulation of alcohol consumption, proper infrastructure and road education are necessary, as well. What do you think is the relationship between driver’s tests and road safety in Mexico? Mexico is a country where road safety is a “new” topic of discussion. It was introduced merely five years ago, and it is becoming more relevant every day. The role of national institutions, such as the Public Health Secretariat, Pan American Health Organization, National Center of Accidents Prevention (CENAPRA), and other NGOs, is to push the topic forward among decision makers, but the country is still in the process of reaching the general public. The issue that has been covered the most in the national arena is alcohol consumption and driving. However, road safety is being accepted as a national plan. This was especially evident when President Felipe Calderón signed the United Nations agreement on the Decade of Action on Road Safety in May this year. Specifically, talking about driver’s tests in Mexico, the experience is quite varied, and the results are, as well. For example, Chihuahua is one of the states that asks for a formal training (similar to ones in the United States) from every driver’s license applicant. Before obtaining a license, applicants must pass a general test of driving behavior and road signal knowledge (whether the training and tests are high quality is another topic in and of itself.) However, at the same time, Chihuahua is the fifth state in the index of mortality in road crashes in Mexico. Hence, we can conclude that there are more elements that should be taken into consideration when improving road safety. What are the elements that contribute to road safety problems in Mexico? There are several elements that should be taken into consideration in order to analyze road safety problems in Mexico. Road safety analysis in urban areas is quite different than suburban places. First, we should start by saying that there is a lack of basic data of road crashes in most cities. Thus, it is quite a challenge to localize the reasons for (and consequences of) traffic crashes. In most cities, road infrastructure tends to serve vehicles instead of pedestrians. There is a need for proper pedestrian traffics lights, pedestrian crossings, islands, accessibility, wide sidewalks, and so on, that attend to the real origin-destination needs of all road users. Public policies are an issue, too. There isn’t a national law that enforces states to ask for proper driver training or tests, nor a set of standards to limit blood alcohol content while driving. Besides, the fee for breaking the traffic law is unbalanced between metropolitan areas and states. For example, a lot of people that live in Mexico City prefer to register their cars with the state of Mexico because there are weaker traffic rules in that state. Finally, in addition to crash data collection, proper infrastructure, public policies, and regulations of alcohol consumption, there is still a lack of traffic law enforcement that must be combined with road user education. What are the necessary elements in trying to solve road safety issues? First, we should start by creating national policies that address road safety. Without a national plan it is difficult to invest in proper infrastructure, education campaigns, and systems for data collection or law enforcement strategies. It is equally important to establish mandatory road safety programs in all states, companies, transport sectors, and to have partnerships with schools, NGOs, hospitals, and so on, in order to cover all road users and have a broader scope. Finally, with a national strategy, all stakeholders can work together to address road safety. For example, police can start to record data using a standardized format in order to implement the proper action to prevent the causes of crashes. What do you think is the role of sustainable transportation (i.e. cycling, walking and public transport) in achieving road safety? And how are these forms of transport being incorporated in Mexico’s cities? The role of sustainable transportation is quite broad. In cities, most people use public transport every day to reach work, school, hobbies, and so on. For example, in Mexico City almost 80 percent of daily trips are made using public transportation, according to the most recent origin-destination survey of the Mexico City government. Subways, light trains, BRTs, conventional bus systems, segregated cycling paths, and all the examples of public transportation with proper facilities definitely make a difference in road safety, especially when people prefer to use sustainable transportation and travel less in private cars. Public sustainable transit is an excellent opportunity to improve road safety. The new infrastructure that comes with a BRT system, for example, helps with decreasing road crashes since it provides safe pedestrian spaces and crossings. It’s important to apply the elements of pedestrian accessibility and safety of BRT stations along the entire origin to destination path.